Albert Jake Kingman Turquoise Graduated Row Bracelet size 6 3/8"
This graduated row bracelet by Navajo silversmith Albert Jake is set with seven perfectly matched oval stones of natural, untreated Kingman turquoise from Arizona. The stones are set in smooth bezels and raindrops are interspersed between the stone settings along both edges of the cuff. Deep bands of stampwork decorate the cuff to the terminals. 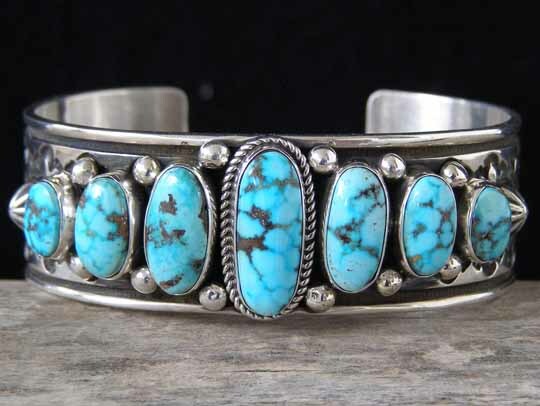 This is very fine natural Arizona turquoise in a classic graduated row bracelet. Hallmarked A.JAKE and stamped Sterling inside. Stones: center 3/4" x 5/16"; 2 ovals 9/16" x 1/4"; 2 ovals 7/16" x 1/4"; 2 ovals 3/8" x 1/4"
Uniform width of cuff: 13/16"